From NYU panels to Brooklyn Library, from the sprawling Jacob Javits Center on the Hudson River to the landmark Strand Bookstore, Russian writers make it in New York during the second annual “Read Russia” initiative. In the third-floor reading room of the legendary Strand Bookstore in New York, a salon of Russian authors read from their newest works and animatedly discussed the literary future of their country. Not unexpectedly, there was some disagreement about prospects for the written word. When the serene Ann Kjellberg, editor at Little Star Journal and contributing editor at New York Review of Books, asked what young people are reading in Russia, the authors took off in a completely different direction. Olga Slavnikova, known first as one of the most significant authors and second as the organizer of the Debut Prize and warm-hearted den mother of young contemporary writers, disagreed vehemently with Amelin’s outlook. Slavnikova, in dark hipster glasses and a dramatic floral dress, took the microphone. “There are very strong poets in the young generation,” she said. “The younger generation of writers today lead much more fascinating lives than we ever could,” said Slavnikova, the author of the highly acclaimed “2017.” She singled out Alisa Ganieva and Igor Savelyev as writers to watch. Andrei Gelasimov, author of “Thirst” and “The Lying Year,” agreed with Slavnikova. Amelin responded by trying a new tack: “Academic poetry does not exist in Russia the same way it does in the United States,” he said with an air of wistfulness. Ann Kjellberg, still tranquil—and best known as executor of Joseph Brodsky’s literary estate - tried to bring the writers back to her original point, which was the huge expansion of literature in Russia. This was a point, when reconsidered, all the authors agreed upon. Among the final events of “Read Russia” 2013 in New York , the Strand Literary Salon was among the most delightful, spirited and provocative. Events also included “War in Words” at New York University’s Kimmel Center, a discussion of Gelasimov’s work with translator Marian Schwartz and Rohan Kamicheril, editor at Words Without Borders and editor of the fantastic collection, “The Wall Inside My Head,” a book which introduced Americans to many new writers from former Soviet countries. 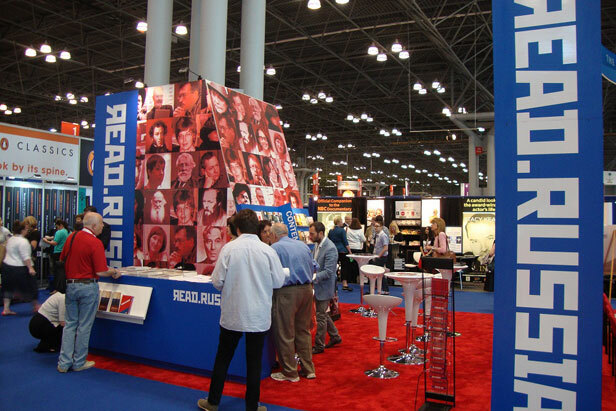 The Read Russia booth at Book Expo America offered talks and seminars throughout the day at the Jacob Javits Center on topics such as The Read Russia English Translation Prize and other translation grant opportunities; the Big Book Prize; and the Yeltsin Center in Yekaterinburg. "When the Read Russia NYC team spoke to each other at the end of the series of events, we were all so excited about the depth of the conversations with the authors and the level of engagement they had with the audience," said Masha Pyshkina, director of public programs for Read Russia 2013. "It was wonderful to walk away with the feeling that in such a short time, we could engage in substantive and powerful discussion. These events really show that Russian literature is not monolithic, but many personalities that came alive for us and the audience." There were new faces at Read Russia 2013, including Irina Muravyova, who read from her recent novel, “The Angel’s Day,” revealing a poignant and vulnerable intimacy that distinguished it from other Russian writers featured this year. She also led a discussion on the dual identities of Russian émigré writers.